Raw vegetable pasta dishes vary greatly, perhaps even more so than their cooked counterparts. These raw pastas are made from zucchini or sea spaghetti. I do not recommend the use of kelp noodles as they are very processed and I don’t feel they’re a healthy food choice. 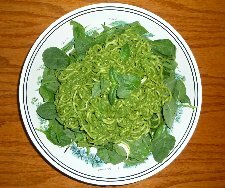 The zucchini can be spiralized with special spiralizing tools available from raw food websites that create angel hair type pasta or thicker spaghetti style noodles. The zucchini can also be shaved with a vegetable peeler or mandolin to create wide flat noodles for use in raw lasagna recipes, or even grated to make an orzo pasta dish. The other form of raw pasta noodles is sea spaghetti, which is actually just dried seaweed with no other processing, nothing added and nothing taken away. As a sea vegetable it is very nutritious and can be eaten with sauce or used to enhance a green salad. The noodles must be soaked for approximately twenty four hours to soften them up, so some forward planning is necessary when using these raw pasta noodles. Sea spaghetti is available from raw foods websites. The zucchini noodles are fresher and lighter and so perhaps better suited for late spring, summer, and early fall. The sea spaghetti being more dense and filling may work better for the cooler seasons, but in the end it’s what appeals to you at the time. As with most pasta, the dressing or sauce can transform the dish from one culinary extreme to the other. And unlike their cooked counterparts, raw pasta is sometimes dressed with sweet sauces; mango and peach are several that come to mind. Both the zucchini and sea spaghetti pasta can be paired with any number of raw sauces, seed cheese or even salad dressings; however it would seem that savory sauces may be best on the sea spaghetti. As with cooked pasta these raw pastas will have their flavor enhanced by the use of fresh herbs. Basil, cilantro, flat leaf parsley, rosemary, sage, fennel, and dill are just a few that come to mind. Paired with the right sauce, these fresh herbs can transport your pasta from bland to phenomenal. You may have to experiment a little, but I’ve never been disappointed with a raw pasta dish yet. Check out all the recipes below and try the ones that appeal to you. And please come back to check out new recipes as they’re added and to post your own favorite raw vegetable pasta and sauce recipes so everyone can enjoy them. Do you have a great raw pasta recipe? One that has helped you increase energy, improve health, or eliminate weight? Perhaps one that you simply enjoy for the mouth-watering flavor? Share it here so we can all reap the health benefits and savor the goodness that you created! Please include the ingredients and preparation instructions to be sure beginners can achieve the same results when recreating your recipe.